I heard an interview with Detroit Tigers starter Justin Verlander before Game 1 where he was talking about what the fans wanted to see from him. It was something about fans wanting to see him pump fastballs past hitters instead of nibbling the corners, and that would be his approach. Well, maybe the long layoff hurt him and the Tigers, or maybe he should avoid worrying about what fans want in terms of pitching advice, as the Tigers got thumped in Game 1 of the World Series. Meanwhile, Pablo Sandoval hit three homers in a row, two off of the mighty Verlander, as he joined Reggie Jackson, Babe Ruth and Albert Pujols as the only hitters to hit three homers in a World Series game. It’s been a crazy postseason in baseball, and anything can happen, but this was a great start for the Giants. The World Series kicks off tonight with an interesting pitching matchup, as Justin Verlander takes on Barry Zito in game one between the San Francisco Giants and the Detroit Tigers. Verlander is considered to be one of the best, if not the best, pitcher in baseball. He’s also rumored to be dating Kate Upton. So life is pretty good for the guy right now. Meanwhile, Barry Zito has revived his career. He was once a dominant pitcher, but then several years ago the Giants didn’t even put him on the World Series roster. Now he’s starting game one. And that’s how it often goes in baseball. Pitchers at the top of their game can lose it, but you never know when or if they might get it all back. Zito is one of those guys. The Super Bowl is great, but there are few experiences like a World Series game. There’s all sorts of excitement in each city, with tons of memorabilia for sale as everyone wants something to remember the event. Also, this stuff can be worth something in the future as well. Things like programs are very valuable, and even third party stuff can be cool. All sorts of entrepreneurs try to cash in. Taking their ideas to a printing company or using UPrinting online brochure printing and then selling their creations on the side of the road. Of course you have to be careful. You have to respect the MLB trademarks, so if you’re selling your own creation without an MLB license, it better be completely original and not infringe on MLB trademarks. Every year a hero emerges, and that’s where creative entrepreneurs can do cool stuff with nicknames, etc. Hopefully you’ll get the chance to attend one of the games in San Francisco or Detroit. And pick up a cool thing to remember the experience! The All-Star Game is tonight, and after it we’ll have a dearth of baseball to watch until Friday, so there really isn’t all that much for me to write about this week. As such, I’ll be deciding who’d win each of Major League Baseball’s most prestigious awards if they handed them out at the halfway point too. I know it’s what everybody else is doing, but the last thing the world needs is more All-Star Game coverage. If the award was for the American League’s best player, there’s no question it would go to the Ranger’s Josh Hamilton. Hamilton leads Trout (and the majors) in slugging (.635), OPS (1.016), runs created, and offensive winning percentage. If you’re into more traditional statistics, Hamilton’s got 27 home runs and 75 RBI to Trout’s 12 and 40. But alas, this is the award for the league’s most valuable player, not its best. Which, by the way, is why Peyton Manning should have been the NFL MVP for the past decade, including the year he got hurt. Nay, especially the year he got hurt. Do you think a good team goes 14-2 and 10-6 then just up and drops to 2-14? But I digress. So what makes Trout so valuable, so Manning-esque, if you will? Well, the Texas Rangers are 52-34, 18 games over .500. Hamilton’s been a tremendous part of that, don’t get me wrong, but the people of Texas also have 7 other All-Stars to thank. And when Hamilton got off to an indescribably hot start in April and May, the Rangers went 31-20, giving them a winning percentage of .608. Since, ol’ Josh has cooled off, to say the least, hitting .214 with six homers in June and July. But don’t tell the Rangers, because I don’t think they’ve noticed yet. Texas has gone 21-14 over that stretch, which makes for a winning percentage of .600. The Angels, on the other hand, have four All-Stars, including Trout, and a record of 48-38. “48-38, that’s not bad at all,” you say. But wait, the Angels were 6-14 before calling Trout up from Triple A. Since he joined the team, they’re 42-24. 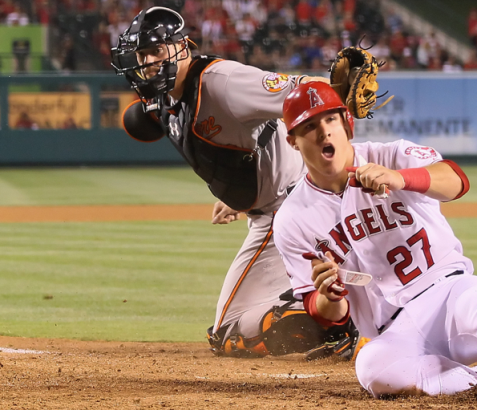 If the only Angel games that counted were those that included Trout, they’d be 18 games over .500 too. Then, there’s the stats. Sure, Hamilton’s got the lead in those other things. But Trout is hitting .341, and has an OBP of .397. He also leads the AL with 26 stolen bases. Those numbers have been an enormous factor in his scoring 57 runs in 64 games. The AL runs leader, Ian Kinsler (who plays for the Rangers, by the way), has 63, but he’s played in 20 more games. As much as I desperately want to give this one to David Wright, the nod has got to go to McCutchen over both he and Joey Votto for many of the same reasons Trout won over Hamilton. Find me one sportswriter who predicted the Pittsburgh Pirates would be in first place at the All-Star break. Just one. You can’t, and while some might say no one saw the Pirates coming, the truth is no one saw McCutchen coming, because they’re one and the same. Andrew McCutchen is the Pittsburgh Pirates’ offense. Sure, they’re in first place, but they rank 21st in runs scored, 22nd in batting average, and 29th in on-base percentage. A team that’s tied for last in the National League in the most important stat in baseball is in first place (take that, Billy Beane! ), and the reason why wears number 22. McCutchen’s .362 batting average is the best in the league, and he’s in the top 5 in home runs and RBI. But more important are his ranks relative to the rest of the Pirates. He leads the teams in hits, runs, RBI, average, on-base percentage, slugging, stolen bases, and home runs. Frankly, I’m not only concerned that the Pirates wouldn’t be a first place team without Andrew McCutchen, but that they would simply cease to exist. This just might be the closest contest on the list. It’s really a toss-up between Weaver, Justin Verlander, and Chris Sale, but my coin kept coming up Weaver. Verlander might be more exciting, with his 128 strikeouts to Weaver’s 73, but there’s no doubt Weaver’s been the better pitcher overall. The 29 year-old righthander has the majors’ best ERA (1.96) and WHIP (0.90). As if that wasn’t enough, Weaver threw a no-hitter on May 2, and he’s only given up more than 3 earned runs twice this season. If you take away his May 13 outing against the Rangers, in which he went 3.1 innings, and gave up 10 hits and 8 earned runs, Weave would be 10-0 with a 1.25 ERA and a whip of 0.816. And c’mon, everybody gets one. Little could please me more than to announce that R.A. Dickey will be taking home the imaginary trophy for mid-season NL Cy Young. Unless of course you didn’t know the Mets got their first no-hitter this year. Oh, you’d heard? Alright, moving on. Yes, that’s right! At the tender age of 37, born again knuckleballer R.A. Dickey has become not just an elite pitcher, but the best pitcher in the National League this season, and don’t you dare say otherwise. Dickey has fluttered his way to a 12-1 record, a 2.40 ERA, and a .093 WHIP. That’s not all, he’s got 123 strikeouts in 120 innings pitched and needs to whiff just 11 more batters to match his career high. Let’s put those numbers in perspective, shall we? Dickey leads the NL in WHIP, wins above replacement, wins, complete games, and games with double digit strikeout totals. He also went a full month without giving up an earned run, and in June, he pitched two consecutive one-hitters. Now, guys who’ve thrown knucklers have been given plaques in the Hall of Fame (Phil Niekro, Hoyt Wilhelm, Ted Lyons), and one, Dutch Leonard, even started an All-Star Game in 1943 (Dickey should have been the second, but if we walk down that road I’m not sure we’ll come back). But a knuckleballer has never, not once, won a Cy Young, so let’s hope Dickey keeps this up and turns my imaginary trophy into real brass. When your MVP is a rookie, it logically follows that he’ll be rookie of the year as well. Mike Trout as AL Rookie of the year is perhaps the only no-brainer on this list. Seriously, it’s not even close. I’ve already told you all about Trout’s stats and how important he is to his team, so instead let’s discuss something else: the rarity of a player winning both the MVP and Rookie of the year in the same season. If this were to happen to Trout (which it probably won’t, but these are the mid-season awards damn it), he’d be just the third man to accomplish the feat. Only Fred Lynn (1975) and Ichiro Suzuki (2001) have done it before. And Ichiro wasn’t really a rookie, the dude was 27 and already had nearly a decade of professional baseball under his belt when he showed up stateside. You could certainly make the case for Diamonbacks lefty Wade Miley and his 9-5 record, 3.04 ERA, 1.09 WHIP, and 70 strikeouts, but weighing the pros and cons of this one always leaves me centered on one thing: Bryce Harper is 19 years old. Did that not hit you hard enough? How about this? Bryce Harper was born in 1992. Yep, that did it. Sure, Miley is having a great year for any pitcher, let alone a rookie, but he’s doing it at age 25, right around the time pitchers are supposed to be coming into their own. But again, Harper is 19, and statistics indicate hitters peak between the ages of 27 and 29. He’s only going to improve over the next 8-10 years, likely bringing a good deal of woe to my Mets while he’s at it, but for now we’ve got to just stand in awe at the single best teenage player in Major League history. Yeah, I said it. Harper is hitting .282 with 8 homers, 10 stolen bases, 25 RBI, and 43 runs scored in 63 games. Only two players in history have equaled or surpassed Harper’s .282/.354/.472/.826 line while still in their teenage years. They were Mel Ott (a future hall of famer) in 1928 and Tony Conigliaro in 1964. But neither was led a first place team in both average and on-base percentage, as Harper does with the Nationals, nor were they asked to routinely play a position entirely foreign to them before getting to the bigs, as Harper does in center field. A knuckleballer has never won a Cy Young and a teenager has never been rookie of the year, but if things keep going as they have been, both those things are going to change. With April now in the books, what were some of the biggest surprises through the first month of the 2012 MLB Season? I’ve outlined five shockers below. It’s not completely surprising that Albert Pujols is slumping at the plate to start the season. After all, midway through April last year he was hitting just .222 for the Cardinals with only one home run. But who could have predicted that Pujols would look this bad in his first full month with the Angels? He has zero home runs, is hitting just .217 and has collected only four RBI. He’s clearly pressing right now and it doesn’t look like he has a clue on how to shake out of his funk. He’ll eventually come around but thus far, his struggles at the dish have been national news. Who would have thought that Adam Wainwright would be the biggest issue facing the Cardinals’ pitching staff through the month of April? Entering Tuesday’s action, Wainwright was sporting a 0-3 record with a 7.32 ERA. Meanwhile, Kyle Lohse and Lance Lynn are both 4-0 and Jake Westbrook is 3-1 with a 1.30 ERA. In fact, Wainwright is the only Cardinals’ starter that has an ERA over 2.78. When Wainwright eventually figures it out (and he will), and Lohse, Lynn, Westbrook and Jaime Garcia continue to pitch as well as they have, the Cardinals will be extremely tough to beat in the National League again this year. The Washington Nationals are in first place. Ask the Pirates – being in first place after the first month of the season or even at the All-Star Break (as Pittsburgh was last year) doesn’t mean squat. But the Nationals have been fun to watch regardless. Adam LaRoche has been fantastic, as he’s leading Washington in average (.329), home runs (4), RBI (17), OBP (.415) and total hits (27). But the other story has been the Nationals’ pitching, as four of their five starters have ERAs south of 2.00. The organization just brought up rookie phenom Bryce Harper too, which virtually guarantees that the Nationals will be relevant for a little while longer. The Tigers aren’t in first place in the AL Central. Blame the media for this one. Once the Tigers signed Prince Fielder last offseason, everyone just assumed that the rest of the AL Central would just roll over and play dead. But while the Tigers have had issues with their starting pitching, the Indians (11-9, first place) and White Sox (11-11, tied for second) have played well. Justin Verlander continues to be the rock of the rotation and Drew Smyly has been a pleasant surprise, but Rick Porcello and Max Scherzer have been disastrous. Porcello is currently sporting an ERA of 6.45 while Scherzer’s ERA is an abysmal 7.77. It doesn’t matter if Fielder and Miguel Carbera continue to hit the snot out of the ball – if the Tigers’ pitching doesn’t come around then there could be an upset brewing in the AL Central. The Dodgers have the best record in the NL. Ah, the power of Magic. Apparently all it took for the Dodgers to start playing well was for them to be sold. Los Angeles is currently sitting atop the NL West standings at 16-7, which includes a dazzling home record of 10-2. Matt Kemp has been ridiculous through 23 games, leading the league in batting average (.417), home runs (12) and RBI (25, tied with Texas’ Josh Hamilton). Better yet for L.A. Andre Ethier (.276, 5 HRS, 24 RBI) is actually contributing as well. If the pitching continues to be as good as it has (Clayton Kershaw is 2-0 with a 1.78 ERA while Chad Billingsley is 2-1 with a 2.64 ERA), then the Dodgers will prove that their hot start isn’t a fluke. The Texas Rangers are returning to the World Series after a 15-5 thumping of the Detroit Tigers to win the ALCS by four games to two. Nelson Cruz was a beast in the series, pounding out six home runs and 13 RBIs against Tiger pitching. Cruz hit 29 home runs in the regular season in 475 at bats. The Rangers will now play the winner of the NLCS between the Cardinals and the Brewers. The Cards are leading the series 3-2 with Game 6 coming tonight in Milwaukee. The Rangers have never won a World Series. Meanwhile, the Tigers had a great season but had no answer for the Rangers lineup. Justin Verlander wasn’t dominant in the post-season, but at least he did his job.